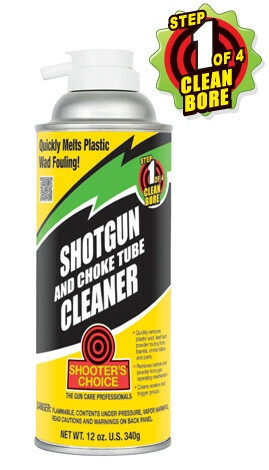 Shotgun and Choke Tube Cleaner (Item #SG012) is designed specially to remove fouling from barrels, choke tubes, and ports. SG012 easily cleans receiver and trigger assemblies. Quickly removes plastic wad, lead and powder fouling from barrels, choke tubes and ports. Removes carbon and powder from gas operating mechanism.